Over the next three years MapsPeople will participate in developing a service robot platform together with the companies Det Gode Firma and Combine along with the Automation and Control section at Aalborg University and the Technological Institute. The project is supported by Innovation Fund Denmark, who has invested DKK 12.7 million to develop and test the robot. If it’s up to the North Jutland robot project, passengers and personnel in airports all over the world will get a helping hand from an entire army of self-propelled robots in just a few years. This will help increase service level, passenger flow, and even airport security. “We’re very happy to be part of this project”, says MapsPeople CEO, Michael Gram. “We’re one of the leading companies in our field and our vision is to stay in front and to create and develop future tendencies within indoor navigation. That’s why we’re proud to be part of a project that might revolutionize the robot industry”. 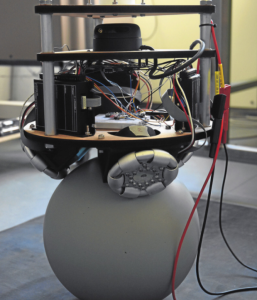 The current robot prototype is called Kugle because it’s a self-propelled device built on top of a ball [in Danish kugle]. The body is 1,5 meter tall and the head made up of a tablet computer, such as an iPad. Interaction with users happens through the tablet computer, where users can either type in or just talk directly to the robot, which we already know from other digital assistants, such as Google Assistant or Apple’s Siri. So, in addition to the physical robots, the consortium is also building a platform for app development that allows developers to program and thus customize Kugle to perform different types of services, e.g. finding missing children by means of sensors, acting as a guide or receptionist at museums or hotels, or giving directions with different types of indoor wayfinding. Daniel Nielsen, Technical Product Owner and Sales Engineer at MapsPeople, explains that MapsPeople contribute with wayfinding functionality and indoor data to the project. “We have extensive experience with building navigation solutions, so our contribution to the project is to deliver the data needed for the robot to navigate inside complex building facilities”. MapsPeople CEO, Michael Gram, continues, “today, a large part of the cancelled ambulant treatments at hospitals are due to patients not being able to find the right ward, but our robot can help them with that. Hospitals, malls, and museums are obvious places to use the service robots”. He further explains that a robot guide can be build to use its tablet computer with built-in camera to guide people around or use different sensors to recognize people and find missing children in stores or amusement parks.